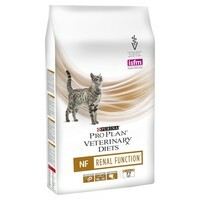 Purina Pro Plan Veterinary Diets NF St/Ox Renal Function Dry Cat Food is a complete veterinary diet for cats to support kidney functions in cases of chronic kidney disease. The diet contains limited amounts of high quality protein to help minimise development of the protein breakdown products (uremic toxins) which make patients feel unwell, while helping to maintain muscle mass. Purina NF also contains restricted amounts of phosphorus which is needed to support the kidney function, and Omega-3 fatty acids which help to enhance natural anti-inflammatory processes and minimise increases in blood pressure inside the kidney.